Description: The Serial Enabled Lcd Allows You To Control A Parallel Based Lcd Over A Single-Wire Serial Interface. 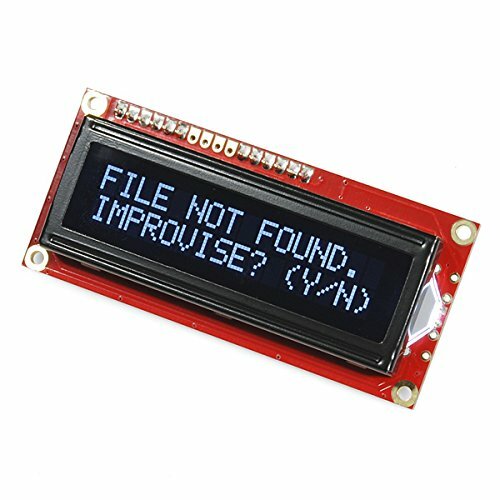 Included In This Product Is A White On Black 16X2 Lcd Connected To Our Serial Backpack. The Backpack, Based Around A Pic16Lf88, Takes A Ttl Serial Input And Prints The Characters It Receives Onto The Lcd. The Installed Firmware Allows For A Number Of Special Commands So You Can Clear The Screen, Adjust The Backlight Brightness, Turn The Display On/Off, And More. Communication With Serlcd Requires 3.3V Ttl Serial At A Default Baud Rate Of 9600Bps (8-N-1). You Can Adjust The Baud To Any Standard Rate Between 2400 And 38400Bps. The Power, Ground And Rx Pins Are All Broken Out To A 3.5Mm Pitch Screw Terminal. Serlcd Has The Ability To Dim The Backlight To Conserve Power If Needed. There Is Also A Potentiometer On The Backpack To Adjust The Contrast. Note: Though The Silkscreen May Say &Lsquo;5V', This Is A 3.3V Serial Lcd. Connect To A 3.3V Power Source.Features:Pic 16Lf88 Utilizes Onboard Uart For Greater Communication Accuracygreater Processing Speed At 10Mhzincoming Buffer Stores Up To 80 Charactersbacklight Transistor Can Handle Up To 1Apulse Width Modulation Of Backlight Allows Direct Control Of Backlight Brightness And Current Consumptionall Surface Mount Design Allows A Backpack That Is Half The Size Of The Originalfaster Boot-Up Timeboot-Up Display Can Be Turned On/Off Via Firmwaredimensions: 1.425X3.15 Inch - 1 Inch Thick.